Did George P. Bush avoid a runoff? What happened in the Texas 7th? Will more Democrats vote than Republicans? Here are the questions likely to draw the most attention as the returns roll in Tuesday night. Texas voters will head to the polls Tuesday in the country's first statewide primary of the Trump era, with voters weighing in on their party's nominees for eight open congressional seats as well as several high-profile statewide races. 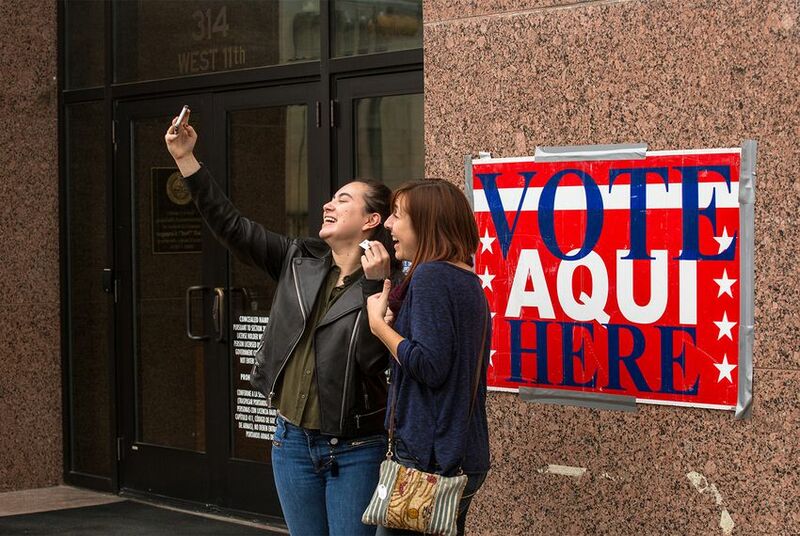 Unlike in many previous election cycles, Texas is the only state hosting a primary on Tuesday and the first in a midterm election cycle drawing intense national interest over whether a possible Democratic wave could flip control of the U.S. House or Senate in November. After two weeks of early voting, Texans who haven't yet cast a ballot have until 7 p.m. today to do so. Will more Democrats vote than Republicans? The snapshot we've seen so far of turnout from early voting suggests Texas Democrats have been more motivated to cast ballots than Republicans. In the state’s 10 counties with the highest number of registered voters, 370,219 Democrats voted early compared to 282,928 Republicans. During the primaries in the last midterms, Republicans outvoted Democrats in early voting in those 10 counties 253,019 to 184,489, respectively. That means Democratic turnout more than doubled from four years ago, while Republican turnout rose less than 15 percent. What we won't know until Tuesday evening: Did those early voting trends hold throughout Election Day and throughout the state? How did the Republican incumbents Gov. Greg Abbott tried to unseat do? After a contentious special session last summer, Gov. Greg Abbott took the extraordinary step of endorsing primary challengers to a trio of House Republicans: state Reps. Sarah Davis of West University Place, Wayne Faircloth of Galveston and Lyle Larson of San Antonio. While Abbott has helped out all three candidates in one way or another, he has taken a particularly intense interest in unseating Davis, who’s being challenged by Susanna Dokupil. His campaign has spent close to a quarter million dollars on the race, much of it brutalizing Davis on TV. Faircloth’s challenger, Mayes Middleton, is seen as the Abbott-backed opponent with the best chance of victory Tuesday. But how all three challengers perform will provide a gauge of Abbott’s political sway — and no doubt color his relationships under the pink dome next session. What happened in the Texas 7th? This is where Texas' role as the first-in-the-nation midterm primary caused a local race to explode onto the national scene. A crowded field of Democrats is running for the nomination to take on Republican U.S. Rep. John Culberson in the fall. National Democrats are fairly quiet about which candidate they would most like to see take him on. But they know who they don't want: journalist and activist Laura Moser, who some Democrats argue is too liberal for the district. To underscore this point, the U.S. House Democratic campaign arm dumped a pile of opposition research on her online, a move that quickly transformed the race into a local rehash of the bitter 2016 Democratic presidential nomination fight between former Secretary of State Hillary Clinton and U.S. Sen. Bernie Sanders. Even some Houston Democrats who agree with their national counterparts' move in spirit worry it only strengthened Moser ahead of Tuesday. And what if Moser does well enough to make an expected runoff? A one-on-one fight between her and an establishment-supported Democrat will certainly turn West Houston into the newest battlefield of a burgeoning Democratic civil war. What happened with Land Commissioner George P. Bush's re-election bid? Bush is facing three Republican primary challengers, including his predecessor in the job, Jerry Patterson. All three challengers have targeted Bush's oversight of the Alamo, particularly his work on the restoration of the site of the historic 1836 battle. He's also faced questions about his handling of funds related to the recovery effort following Hurricane Harvey. Patterson and Bush's two other primary challengers are hoping to keep Bush below the majority of the vote he needs to avoid a runoff. That Bush, the nephew and grandson of former presidents and a popular former Texas governor, may not be able to win his primary outright Tuesday has put a national spotlight on the race. How many primaries for those eight open congressional seats will have to be settled in runoffs? In all likelihood, most of them. Six Republicans and two Democrats in the 38-member Texas congressional delegation opted not to run for re-election, drawing dozens of candidates to those open seat races, including 18 Republicans and four Democrats vying to replace U.S. Rep. Lamar Smith, R-San Antonio. From El Paso to Houston, there are so many candidates running for these nominations that the lift to clear a majority of the vote is near impossible. The likeliest to do so is state Sen. Van Taylor, R-Plano, who has dominated in a three-way Republican primary for the seat currently held by U.S. Rep. Sam Johnson, R-Richardson. Other possible exceptions are state Sen. Sylvia Garcia, who is running for Houston's 29th District, and Republican fundraiser Kathaleen Wall in the nearby 2nd Congressional District. Who came out on top in the costly primary fight between Phillip Huffines and Angela Paxton? The Republican primary for Senate District 8 could be the most expensive and nastiest contest on the ballot Tuesday. It pits Angela Paxton, the wife of Attorney General Ken Paxton, against Phillip Huffines, the twin brother of state Sen. Don Huffines, R-Dallas. With a price tag expected to top $10 million, the race has turned into an all-out brawl between two candidates who are similarly conservative. It’s divided some of the most powerful players on the far right in Texas, not to mention two of the most well-known families in conservative circles. The two are battling to replace state Sen. Van Taylor, R-Plano, who is running for Congress. Nine Democrats have lined up to challenge Republican Gov. Greg Abbott, with most attention centering on two of them: Lupe Valdez, the former Dallas County sheriff, and Andrew White, the son of late Gov. Mark White. Other contenders include Dallas businessman Jeffrey Payne and Tom Wakely, a former congressional candidate from San Antonio. Uncertainty runs deep about how exactly the primary will shake out. Public polling has identified Valdez and White as the most likely prospects for an anticipated runoff, though it has also indicated there are many voters who have not made up their minds. Whoever becomes the Democratic nominee will have a daunting task in trying to dislodge Abbott. The governor consistently ranks as the most popular statewide official, and he has over $40 million saved up for his re-election campaign.